Rome attraction-guides.com - Rome, Italy attractions guide Rome Forum (Foro Romano), Palatino information about attractions, history, fall of the Roman Empire, palaces and temples, views of Circus Maximus, location and address, Via Sacre, tel / telephone number, general tourist information about Forum (Foro Romano) in Rome (Roma) area, Italy (Italia) IT - Last updated 30/10/2012. Spreading along the valley floor between the Capitoline and Palatine hills, Rome's Forum (Foro Romano) was the commercial, political and religious centre of ancient Rome. Constructed more than 900 years ago, Rome's Forum (Foro Romano) is entered from the piazza leading from the Colosseum (Colosseo) and this is located where Rome was once governed from. 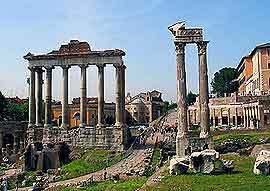 The Forum's general disrepair began during the fall of the Roman Empire and excavations started over 200 years ago. There is much to see at the fine ruins of Rome's Forum (Foro Romano) and attractions include large columns rising from the grass, repositioned pediments that help you to imagine what a wonderful building this once was, the Arch of Septimus Severus, the House of the Vestals, the Temple of Antoninus and Faustina, the Temple of Saturn and the Arch of Titus. Other attractions at Rome's Forum (Foro Romano) include the Palatino, a short climb from the Forum, where you will find the historic remains of many splendid palaces and temples built by the very wealthy Romans, together with a number medieval Rome churches, Renaissance Rome gardens and villas. The hilltop is full of interesting grottoes and historic villas, all covered in ivy and other plants. Rome's Forum (Foro Romano) offer stunning views over the ruins of the Circus Maximus, which was once an enormous chariot racetrack holding more than 200,000 cheering spectators.